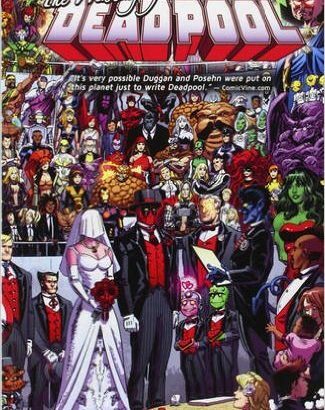 The day you never dreamed would come has finally arrived: Deadpool is getting married! But to whom?! 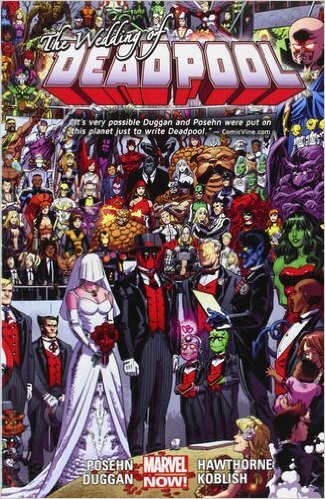 Tune in to find out as Deadpool and his mysterious bride tie the knot! And to celebrate this magical occasion, we’ve rounded up every single writer who ever penned Wade’s series to contribute new stories! But when Deadpool and his bride honeymoon in Japan, will married life agree with our mouthy merc? Or will he start doing the “take my wife, please” joke all the time? Plus: another Deadpool flashback tale, as Wade travels to the 1950s to save Nick Fury from the menace of – time-traveling Hitler! And Madcap teams up (sort of) with Deadpool to answer the burning question. “Whatever happened to the white caption boxes?” Featuring Thor, Daredevil, Luke Cage and more! Collecting DEADPOOL (2012) #26-28 and DEADPOOL ANNUAL (2013) #1.